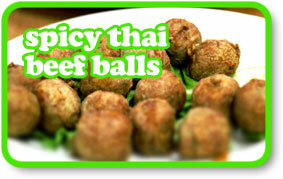 These little spicy meatballs are so delicious you won’t know when to stop, as was the case with me. I ate them with some Indian chapati and a little chopped tomato and coriander. I had to have a little lie down afterwards such was my greed. You’ll need to make a quantity of curry paste first, but fear not, this will last ages if you freeze it in small quantities: I’ve included a couple of small recipes at the end of this to help you eat the rest of the paste. Soak the dried chillies for 5 minutes in a little boiling water. Then, in a food processor or with a hand blender, or if you can be bothered in a pestle and mortar, blend together the chillies, salt, shallots, garlic, galangal, coriander stalks to form a thick, smooth paste. Stir in the pepper, ground coriander, cumin, cardamon, nutmeg, cloves, cinnamon and shrimp paste. Mix well until well combined. Combine all the ingredients (except the oil) in a large bowl with your hands. Mould a tablespoon of the mix into a ball and arrange on a plate. Heat a wok with about 5-6 cm of oil until hot. Add the balls in batches of 5-6 and deep fry until golden brown – 2-3 minutes each. Drain on paper towels and repeat with the remaining balls. Serve as a little snack or starter with some chopped tomato and coriander. STIR FRY VEGETABLES: Heat 2 tablespoons of peanut oil in a wok over a high heat. Add 200g green beans, 200g thinly sliced carrots and 200g baby sweetcorn stir, keeping everything moving for 1-2 minutes. Add 1 tablespoon of curry paste, 2 tablespoons of fish sauce, the juice of 1 lime, 1 tablespoon soy sauce and 1/2 cup water. Sizzle for 1-2 minutes then remove from the heat and serve sprinkled with fresh coriander alongside some boiled rice. COCONUT PRAWNS: Heat a wok with 4 tablespoons of peanut oil. Add 2 tablespoons of curry paste and fry over a moderate heat for 1-2 minutes. Add 1/2 cup coconut milk and fry for a further 2 minutes. Add another 1/2 cup of coconut milk, 2 tablespoons fish sauce, 400g raw (de veined) prawns and simmer gently for 3 minutes until the prawns are cooked. Remove from the heat and stir in 1 chopped tomato, 1 tablespoon chopped coriander, 1 tablespoon chopped Thai basil and some lime wedges to squeeze over. Make sure there’s plenty of boiled rice to accompany.